Really, how can my friends who live in an apt in Dallas, who are both divorced and not getting the money they were supposed to from their respective ex-spouses, who apparently sit around all day and golf and drink, buy a half million dollar house? I would really like to know their secret. Does it make any sense that people send you email and say, “In order to ensure that you receive this mail…” and then they tell you what to do? If you didn’t get the email, you aren’t going to know what to do. If you do get the mail, do they not understand how annoying that is? I heard about this somewhere else. I’ve wondered what happened. I think I heard about it on Stop the ACLU. But I couldn’t find any updates on what happened to the guy who put graffiti on the graffiti wall. Be careful what you say on the phone. A person I was speaking with today learned that lesson. I had called her and been told I had to talk to person B. I called person B and talked to them. They said it was okay with them but the first person (A) would have to make the final decision. So B transferred me over to A. Apparently A’s phone said B was calling, so she answered this way. I didn’t say anything here. I was wondering if I should hang up, so that she wouldn’t be embarrassed to find out she was talking to me. But I didn’t think that would work. So I didn’t say anything. I don’t believe I have spoken to her in person more than twice in the class before. She didn’t impress me as a teacher but, though I mentioned it to friends, I did not talk to anyone at the college about it. I guess I will apologize to her in class tonight. I certainly did not intend to do anything to upset her. She probably didn’t intend to do anything to upset me either. She certainly had no intention of telling me to my face I was rude. But she has upset me. And I’m sure she is embarrassed herself and not too thrilled that I will be in the class with her this evening. … I wonder how many other people she has talked to about my being rude. I don’t know person B. Maybe everyone on campus who knows A thinks I am rude. Update: At least it wasn’t as bad as this (prank) phone call gone bad. Mature content. Bad language. I’m just wondering how soon spellcheckers will recognize Obama. Have you ever been overwhelmed by a project? I know the simple thing is to break it down into smaller pieces and get each one done. But today that isn’t working to fool me into doing it. Instead I am thinking about the twenty or thirty small pieces it will take to get done. I’m not liking that at all. A young girl I tutor in reading asked me this question this week. My boys didn’t grow up with Santa. I frankly told them that he was a myth and that we were Santa. They quietly kept the secret when other kids talked. When my boys were older they told me their kids were going to think Santa was real because we had taken all the magic out of Christmas. But that doesn’t tell you what I told Keyona. I told Keyona that I had never met Santa. She said of course I hadn’t because I hadn’t gone to the North Pole. But my son pointed out that I was lying to her by omission. And I was, in fact, attempting to deceive her. I don’t think it is the same as lying though, but that may be because I did it and I don’t want to be a liar. 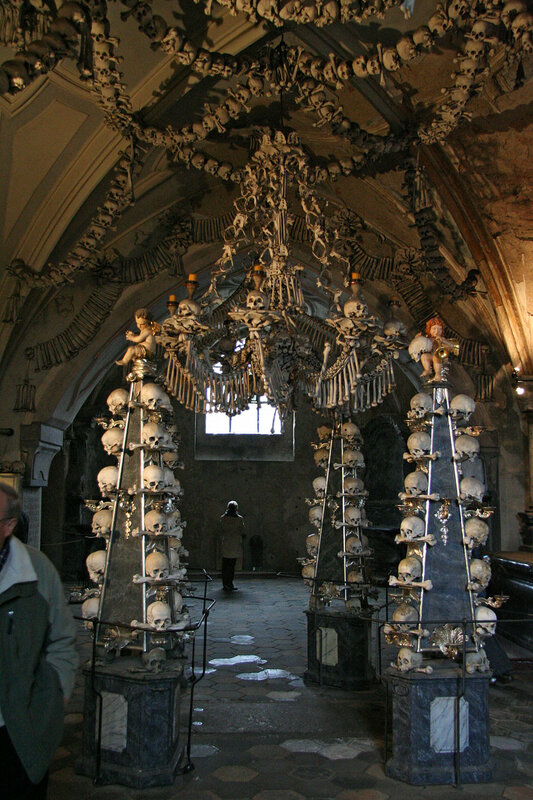 Is this bone church? The address is from the Czech Republic, I think. Gates of Vienna has been blocked, along with all blogspot addresses and many other conservative blogs, by the US Dept of the Interior. Big liberal blogs are still available. I think, most likely, this is an artifact of the new blocking system that they installed. But I know that it had to have been some sort of choice on the programmer’s part. R, what say you? Musings on a different (for me) approach to teaching history and my plan for doing it this year. My youngest is a history fiend. He loves history. He loves alternate history. He knows folks I’ve never heard of in history. (I was a history major in my undergrad.) And at the ripe old age of 13 he’s completed 11th grade American history. My eldest thinks history is boring. History is useless. There is no point to history. Now, I grew up with a love of history. My father was a history major undergrad. (He didn’t recommend it. Said all you could do with it was become a bank teller or a lawyer.) And he loved history. He shared that love through stories and odd facts. I want my eldest son to love history and as he prepares to leave the family nest and head out into the cliffs of college, I only have a year or two left to share my love for it. So I have decided that we are going to try something new and different, for us, in our history class. We’re going to go backwards through time, first of all. I’ve never tried that before. We’ll start with their parents. Surely there is something newsworthy we were involved in. And hopefully we can point them to other people we know who were involved. Maybe I’ll have them read the Mudville Gazette or one of the other military blogs I enjoy to help give them a sense of the Afghanistan and Iraqi wars. They could even write an email to several different bloggers asking the same question (which one I don’t know. They would have to formulate it.) and see what kinds of answers they might get. Okay, maybe we’ll start with their Uncle M who saw the shuttle explosion on his way to work one Saturday. One set of great-grandparents is left. They’ve agreed to be interviewed by email. One was a member of the Civilian Conservation Corps. One they could ask what she sees are the differences between growing up as she did and growing up for children now. Or something else. Their great-grandfather wrote a self-published book, so they’ll need to read that to prep for the interview. There are several older people at our church who, I believe, would be inclined to give interviews if we knew the right things to ask them. (We’ll have to research those.) And it would be fun to visit with the older people. They leave our lives so quickly. So we are going to look at history as it was lived by people we know. They can interview my uncle about occupied Japan. And AB’s mother, who is Japanese, and the same age or a bit older than my uncle. My other uncle was in Korea. I don’t know if they can interview him, but we’ll see. Maybe we could, if I am braver than usual, go to the VFW post and talk to people there. But I’d want to learn about the wars with the boys first. My Oma is 96. She’s been around a long time. If we get to it soon enough we could interview her about her life. Maybe we should start with her. And her daughter visited all around the world with her first husband. She remembers when Lebanon was a beautiful country and had some of the best universities in the world and she was thinking they could stay there and raise their children. I don’t know if we know anyone who chased Chinese spies, or if the internet blogger we have heard of who did that would be appropriate to contact because of his blog content, but we could widen our study of history that way. Maybe, if we go far enough back, we could watch Monty Python and the whole “Bring out your dead” skit for the black plague. “Ring around the rosie” anyone? What is my philosophy of history when it comes to education? It’s not just dates and numbers. Real people lived their lives and left their marks on the world in those dates and numbers. If the people become real to you, the events will live in your mind. Explore the things that you find interesting in much more depth. And then put it in perspective with some simple study of the times around it. what were people doing then for leisure? What were people eating then that we don’t eat now? When did the person you are interviewing first notice that the world it was a changing? If you have any suggestions that you’ve tried in this arena that worked well, I would love to know about them. (I had some other title, but I figured my husband wouldn’t read the post as it was. So I came up with that title, which is accurate, but much longer than I had originally intended.) Language Log has a post about a dialog box that pops up on the mailer and isn’t linguistically coherent. What happened to Apple’s “intuitively obvious” responses? And, also on Language Log, a response/explanation for the poorly written dialog boxes. Sometimes even watching true programs, like “Get Color,” can lead one to imagine things that are not true. How much money do those people have to agree to spend? Just two days ago I was watching several Tivo’ed programs. And the hostess of “Get Color” mentioned that the floors were done in jatoba wood. It’s an exotic hardwood that darkens as it ages. I thought it sounded great. Jatoba apparently is a fancy word for “Brazilian cherry,” which is also beautiful sounding. And at $4-8 a square foot, it ought to be beautiful. So those people spent, I don’t know, $5000 on their floors alone. And they painted, got accessories, new furniture, new windows… How much do they have to have? I don’t know. But it must be a small to middling fortune. Like maybe two or three years worth of insurance payments. What do you do when someone you know and admire loses the most important person in their life? Especially when they don’t know you. I’ll say a prayer for the three of them tonight. I have finally decided that the all-knowing they are just flat out WRONG. Look here on June 4 and tell me if you’ve ever looked like that when you’ve had gas. I’ve never looked like that from gas. So why would a baby? While you are there you could read about Keith’s travails with his cancer and their joy in their son. And pray. There have been two recently, among my daily read blogs, that I was interested enough in to want to do. I don’t want to make this the 18th blog entry for Flag Day, so I am going to save it and continue editing tomorrow, which is when I will probably actually finish this blog entry. Drats. I published, rather than saving. Drats. First, though, Boudicca’s Voice caught my attention because the meme she was answering came from Practical Penumbra. As far as I know, I’ve never read that blog- it wouldn’t come up for me when I tried to access it via the link on B’s- but I just reread all my words of the day and “penumbra” was one of those words. It means, for those of you who have not just refreshed your dicitonary in the search for it, the outer gray area of a sunspot, some other thing, or, the most likely use for anytime you will read it outside a science journal, an inconclusive or unclear area within some specific arena of thought/discussion. I like it as a word, though I’ve never used it in a sentence and am not sure I could. And I like it as the title of the blog. It was thus that Boudicca’s most recent foray into memedom caught my attention. A box of week old pizza, handtossed cheese and tomato and pineapple pizzas. Cut up veggies, brought for the vegetarians in my family, who grazed only as much as they were required to. But I thought I might eat some later, so they stay. A wild pair of red slippers that my husband purchased because the hospital said I must have crepe or rubber soled shoes and we were already gone from the house. A beautiful pink and gold Thai -scarf?- that my mother bought me while she was in Thailand with my father several years ago. Then she bought me a dress to match it later. A bunch of black clothes, because, despite the items above, black has been my staple, my prime color of choice in the last 20 years of dressing. An empty checkbook. We used the last check to pay the hospital. And a black change purse that looks quite dour in my tweedy, weedy, white purse that I bought when I decided to out myself from black. Several maps, but none of the state in which we reside. A CD of love songs from my wonderfully romantic husband. And thus we come to the end of Boudicca’s meme. I enjoyed it. Feel free to acquire it yourself, if you would like. There is a game known as â€˜6 Degrees of Separationâ€™ (from Kevin Bacon). The way the game works is to try to connect 2 famous people via 6 associations. We have been watching the blogsphere for the last year or so and believe that nearly all blogging homeschoolers will hear about important news items, etc. within 3 days of the first mention in a HS blog. 1- If this is the first blog in which you have seen this post and you would like to contribute to the experiment, copy the entire post and post it in your blog. That way, visitors can directly see the chain of communication that ended with this post in your blog. 3- Leave a comment in the blog where you first viewed this post indicating that your blog is among the next degree. 4- If you are a homeschooler or are interested in/considering homeschooling and either do not have a blog, would prefer not to blog this or the sixth degree is already taken, you can still contribute to this experiment by leaving a comment in the blog where you first read it. 5- After 3 days report back how many people read, commented and blogged based on your post to the blog where you first read this. (They only report this blog would receive is from the degree below and this blog will report the total from below and comments here to the degree above.) To illustrate how this would work letâ€™s suppose that in this imaginary example every blog has approximately the same number of readers and that each blog entry for each degree ends up with exactly the same number of comments. That totals 268. If you change the number of experiment posts to 3, the result is ( 5 + 11 + 29 + 83 + 245 + 731 + 2189 = ) 3293. Consider what the number would be when we average about 60 readers a day. (Welcome to math 101) Letâ€™s allow a week for the reporting to roll back through the earlier degrees. FYI: The original for me was Roughcut Gems who has a new design on her blog. I like this sort of thing, so I tend to do it. It will be interesting to see if anyone picks it up from me and where it goes if they do. I’ve been trying to get stuff together to send soldiers who have been injured and are at Walter Reed cards. I’ve almost got three per person. I’ve sent some and will send some more today. That’s not enough. But I don’t know what else to do. Then today I took my car in to get the headlight changed. They did it and wouldn’t let me pay them anything. I told them you pay for expertise and I brought it in so they could fix it. They said they did and wouldn’t charge me for it. I’ve been talking to a friend, who is a scientist, about creationism and evolution. Honestly, I don’t have much of a background in the areas necessary to cover this. I think I read a really long and involved blog post about the topic about a year and a half ago, but I have no idea who or where. However, today I read an interesting little snippet from JunkYardBlog. In verse 6, an â€œexpanseâ€ is formed, and from that the earth eventually forms. The Hebrew word for expanse is raqiya, which means â€œto beat out or spread out,â€ and the intended mental image is of something being beaten flat out like pizza dough tossed in the air. The reigning scientific theory of planet formation today holds that planets form in disks of dust and material that spread out from a cloud with a star forming at the centerâ€”raqiya in action. The Genesis text is more than 3,000 years old, yet it shadows the latest science. Genesis 1 also mentions water several times, and we now know that the Orion Nebula, again a fairly typical star-forming region, is chock full of water vaporâ€”enough to fill the earthâ€™s oceans every minute for 10,000 years according to some estimates. And the progression, from plants to sea life to birds and land life and finally humans, is remarkably similar to the sequence youâ€™ll find in any science textbook. Itâ€™s not a perfect match, at least not yet, but consider who got there first. I still wish I knew more, but this is a good start.